Le Victorien, designed by Graham Cooke and opened in 1998, is a member of the Groupe Beaudet. 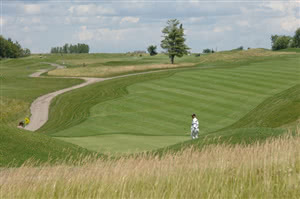 The 7,000 yard monster of an 18 hole championship course is set on rolling parkland to the south of Mirabel. The course has been superbly designed to maximize every hazard and landform of this splendid plateau in the Lower Laurentians to ensure the course is full of challenge. When it’s not the water lurking on the edges of the fairways, it’s the ravines and narrowness of certain holes that will do you in. Plus, as if that's not enough, the exposed site means that wind is generally also to be contended with.